There are some good essays online on the flat earth myth -- the belief that people thought the earth was flat prior to Columbus. I recently linked to this post by M&M, here's another, and here's one James wrote. Humphrey wrote a couple of excellent blogposts on it here and here. The go-to book for all of this is Inventing the Flat Earth: Columbus and Modern Historians by Jeffrey Burton Russell (you can read a short essay by Russell here) who traces the myth to about 1830 when Washington Irving wrote his "history" of Columbus. Rather than add to what they wrote, I'd like to address a parallel issue. Once non-Christians started ridiculing Christianity as promoting a flat earth, some Christians sought to defend their faith by ... accepting a flat earth. The most prominent defender, in the mid-19th century, was Samuel Rowbotham, who wrote the book Zetetic Astronomy: Earth Not a Globe. Rowbotham compiled dozens of evidences supporting his claim that the earth was flat and stationary, such as lighthouses that could be seen from further away than they should if the surface is curved, cannonballs fired straight up from moving platforms (demonstrating that the earth is not moving), etc. To this day there is a flat-earth society which defends this kind of thing. Here is a list of flat-earth literature available to read online. A list of resources by and about flat-earthers is here. I collect flat-earth literature. It seems to me to be an extreme example of Christians reacting to the conflict myth by letting secularists tell them what to believe, another example being contemporary defenses of geocentrism, something which has gained support among young-earth creationists. That leads me to my main point: I think young-earth creationism is another example of Christians letting secularists define Christian belief. I don't think it's on the same level as belief in a flat-earth for the simple reason that, throughout history, many of the holiest Christians believed the earth and universe to be young. Nevertheless, the history of young-earth creationism in the last 50 years reveals it to be a reaction rather than a reasoned response, in a very similar fashion as belief in a flat earth was a reaction against the forces of secularism. I submit that this is not an appropriate way for a Christian to act. You can't love the Lord with all your mind if your theology is based on knee-jerk reactions. Moreover, it leads to two deplorable situations: first, as I've already mentioned, where the dictates of one's faith are actually made up by people trying to mock it. As I've mentioned before, I don't think it's wise to let those who deprecate our faith define it for us. Second, it creates a rather large stumbling block for belief in Christianity. If that's what you have to believe in order to be a Christian, then it just obviously fails the smell test. There are plenty of parallels between young-earth and flat-earth literature. Both make their claim the linchpin to orthodoxy, so that disagreeing with them leads to the denial of central doctrines. Both locate the problems of contemporary society in the rejection of their claim. Both claim that the denial of their claim makes God into an incompetent Creator. Both claim that the denial of their claim is a purely recent phenomenon. Both explicate their claim via bluster and a feigned over-confidence. Etc. To me truth is precious. I love it. I embrace it at every opportunity. I do not stop to inquire, Is it popular? ere I embrace it. I inquire only, Is it truth? If my judgment is convinced my conscience approves and my will enforces my acceptance. I want truth for truth's sake, and not for the applaud or approval of men. I would not reject truth because it is unpopular, nor accept error because it is popular. I should rather be right and stand alone than to run with the multitude and be wrong. Methinks he doth protest too much. OK, remember that post by Michael Flynn refuting one of the more inane atheist websites? Someone told them about it, and they tried to write a rebuttal. You'll think I'm joking, but they actually claim that Flynn's list of references doesn't count because you can't read them online. "This is the world of the internet and Flynn provided no links for his readers to check his sources. They just have to believe that he got his information correct." Well, either that or, you know, read the books. Fortunately, we're not left to our own resources in debunking their deep learning because Flynn has done it for us. Here's part 1 and part 2. Flynn's also blogging at the TOF Spot so you can read the same posts there as well (part 1; part 2). Men are reluctant to pass over from the notion of an abstract and negative deity to the living God. I do not wonder. Here lies the deepest tap-root of Pantheism and of the objection to traditional imagery. It was hated not, at bottom, because it pictured Him as man but because it pictured Him as king, or even as warrior. The Pantheist's God does nothing, demands nothing. He is there if you wish for Him, like a book on a shelf. He will not pursue you. There is no danger that at any time heaven and earth should flee away at His glance. ... And therefore this is the very point at which so many draw back -- I would have done so myself if I could -- and proceed no further with Christianity. An "impersonal God" -- well and good. A subjective God of beauty, truth and goodness, inside our own heads -- better still. A formless life-force surging through us, a vast power which we can tap -- best of all. But God Himself, alive, pulling at the other end of the cord, perhaps approaching at an infinite speed, the hunter, king, husband -- that is quite another matter. "Any comparison of Matthew 1-2 and Luke 1-2 to pagan divine birth stories leads to the conclusion that the Gospel stories cannot be explained simply on the basis of such comparisons. ... For what we find in Matthew and Luke is not the story of ... a divine being descending to earth and, in the guise of a man, mating with a human woman, but rather the story of miraculous conception without the aid of any man, divine or otherwise. As such, this story is without precedent either in Jewish or pagan literature." In the comments to a few posts I've pointed out that while my sympathies definitely lie with Analytic philosophy, I've developed an appreciation for Continental philosophy. It seems to me to leave far too much room for speculation, and thus of determining one's conclusions in advance, but nevertheless I think it has some value. If you have a high view of Kierkegaard and Nietzsche, like I do, you simply can't ignore it. Again, this is just a handful of the religious titles in this series -- a series not about Continental philosophy and religion, but just Continental philosophy. However, you should probably take all of this with a grain of salt since Fordham University is a traditionally Catholic school. I have sometimes been told that belief in naturalism -- i.e. that the natural world is all that exists and there is thus no supernatural -- has an inverse relationship with how close the individual is with the hard sciences. In particular, I've heard that physicists are rarely naturalists, chemists slightly more frequently, biologists more, and then when you get into the social sciences and philosophy, naturalism and even anti-religious sentiments often play a large role. I classify physics as the harder science because it is presupposed by the other levels, although they aren't necessarily reducible to it. You can have physics without chemistry, but you can't have chemistry without physics. Similarly, you can have chemistry without biology, but you can't have biology without chemistry. Of course, biology is still a hard science. But when you get to that level, there is more room for speculation, and so more ways to avoid conclusions one is not predisposed to. But this may all be false, because when you go another level harder from physics, you get to particle physics which strikes me as very speculative. At any rate, I have often been told that there are many physicists who draw religious conclusions from their studies. Freeman Dyson is one. Paul Davies is another. And the further you go from physics, the less prone a scientist is to see "something going on behind the scenes." If you know of any studies confirming or refuting this, please let me know. I'm interested. ...it is interesting to note that the demand for the absolute universality of physical laws comes, as a rule, not from the physicists, not from the chemists, but from a small number of biologists, a larger number of psychologists, and most of all from the naturalistic school of the philosophers. The mechanistic philosophers are much more royalist than their king, and the demand for the universal sway of the mechanical seems to vary directly with the square of the distance from headquarters. If this was correct 90 years ago, and is still correct today, it's an interesting point. Those who are face to face with nature think it testifies to something beyond itself, while those who deny this tend to be those furthest removed from it. But of course this observation may be incorrect. I'm just a philosopher myself, after all. I recently listened to a debate between William Lane Craig and John Shelby Spong on the historical Jesus (this was an actual debate, unlike the presentation and response Craig had with Dennett). You can listen to it here. Craig argued that Spong is so insulated that he doesn't know what scholars outside of his small circle actually say. He points out that a survey of NT scholarship of the last few decades indicates that three-fourths of the scholars writing on the subject accept the historicity of Jesus' empty tomb, and almost universally accept his post-mortem appearances as historically demonstrable. Moreover, most scholars today recognize that the four gospels are written as historical writing, specifically in the genre of ancient biography -- not myth, not legend, not allegory, not midrash (as Spong claims). Spong seems genuinely puzzled by this. It reminds me of something N. T. Wright wrote of Spong in Who Was Jesus? What is central is that Spong apparently does not know what 'midrash' actually is. The 'genre' of writing to which he makes such confident appeal is nothing at all like he says it is. There is such a thing as 'midrash'; scholars have been studying it, discussing it, and analysing it, for years. Spong seems to be unaware of the most basic results of this study. He has grabbed the word out of the air, much as Barbara Thiering grabbed the idea of 'pesher' exegesis, and to much the same effect. He misunderstands the method itself, and uses this bent tool to make the gospels mean what he wants instead of what they say. We may briefly indicate the ways in which genuine 'midrash' differs drastically from anything that we find in the gospels. First, midrash proper consists of a commentary on an actual biblical text. It is not simply a fanciful retelling, but a careful discussion in which the original text itself remains clearly in focus. It is obvious that the gospels do not read in any way like this. Second, real midrash is 'tightly controlled and argued'. This is in direct opposition to Spong's idea of it, according to which (p. 184) 'once you enter the midrash tradition, the imagination is freed to roam and to speculate'. This statement tells us a good deal about Spong's own method of doing history, and nothing whatever about midrash. The use made of the Old Testament in the early chapters of Luke, to take an example, is certainly not midrash; neither is it roaming or speculative imagination. Third, real midrash is a commentary precisely on Scripture. Goulder's theories, on which Spong professes to rely quite closely, suggest that Luke and Matthew were providing midrash on Mark. It is, however, fantastically unlikely that either of them would apply to Mark a technique developed for commenting on ancient Scripture. Fourth, midrash never included the invention of stories which were clearly seen as non-literal in intent, and merely designed to evoke awe and wonder. It was no part of Jewish midrash, or any other Jewish writing-genre in the first century, to invent all kinds of new episodes about recent history in order to advance the claim that the Scriptures had been fulfilled. It is one of the salient characteristics of Jewish literature throughout the New Testament period that, even though novelistic elements could creep in to books like Jubilees, the basic emphasis remains on that which happened within history. A moment in the debate that particularly struck me was when Spong related how Carl Sagan had once approached him and said something to the effect of, if Jesus had ascended away from the surface of the earth at the speed of light, he'd still be in the Milky Way galaxy. This is essentially the claim that the Ascension was predicated on a local heaven just above the clouds and thus that the ancients and medievals didn't know the universe is incomprehensibly large, something I showed to be false here. The fact that Spong thinks this is a good or original point further demonstrates how insulated he is. The South England Legendary, written in the 13th century, says something similar. C. S. Lewis writes in The Discarded Image, that the Legendary is "better evidence than any learned production could be for the Model as it existed in the imagination of ordinary people. We are there told that if a man could travel upwards at the rate of ‘forty mile and yet som del mo’ a day, he still would not have reached the Stellatum (‘the highest heven that ye alday seeth’) in 8000 years." Since this was common knowledge several hundred years before it occurred to Sagan or Spong, I can't get too excited about their "insight", much less their claim that it threatens traditional Christianity -- a point that the South England Legendary somehow misses. When a mover sets a body in motion he implants into it a certain impetus, that is, a certain force enabling a body to move in the direction in which the mover starts it, be it upwards, downwards, sidewards, or in a circle. The implanted impetus increases in the same ratio as the velocity. It is because of this impetus that a stone moves on after the thrower has ceased moving it. But because of the resistance of the air (and also because of the gravity of the stone) which strives to move it in the opposite direction to the motion caused by the impetus, the latter will weaken all the time. Therefore the motion of the stone will be gradually slower, and finally the impetus is so diminished or destroyed that the gravity of the stone prevails and moves the stone towards its natural place. In my opinion one can accept this explanation because the other explanations prove to be false whereas all phenomenaa agree with this one. In Medieval Europe, natural philosophy was significantly changed by an influx of Arabic and Greek works. 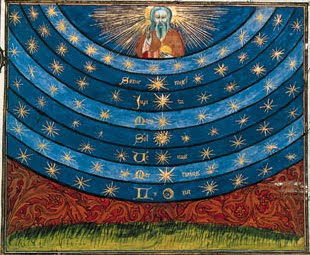 These would mean that the system of astronomy in the Middle Ages would be basically Ptolemaic and Aristotelian. The first popularising text was one written by Al Farabi in the 9th century and translated by John of Seville in 1137. This gave the basics of the Ptolemaic system and long remained a standard text. It was in turn replaced and improved upon by a work called ‘The Sphere’ (In reference to the spherical cosmos) by Sacrobosco, whose real name was John of Holywood. John had taught at the University of Paris from 1230 to 1255 and had written ‘The Sphere’ when he was there in 1250. This work became a standard textbook on astronomy until the 17th century and went through numerous editions (High school textbook writers note; it discusses ‘the spherical earth’). One of the things the Middle Ages had inherited from earlier cultures was a tension between Ptolemeic views of cosmology and Aristotelian physics. The basis of this was that Aristotle was really interested in the causes of motion and the ways in which the universe functions in a physical way. According to Aristotle, the earth has to be in the centre because that is the low point, the place to which heavy bodies naturally tend. Ptolemy on the other hand was preoccupied with getting the positions of the planets exactly right and having a predictive model that accounts for heavenly phenomena. The conflict came because, in order to do this, Ptolemy moved the earth from the centre of most of the celestial spheres. The spheres thereby orbit an eccentric, which is not coincident with the centre of the earth. This caused a lot of problems with Aristotelian physics. There was therefore a strong feeling against Ptolemy in Spain by Arabic authors; a good example being Muhammad Ibn Rushd (Averroes). His feeling was that Ptolemy should be rejected entirely in favour of a completely Aristotelian system regardless of what it would do to predictive astronomy. These controversies did not produce any workable solution. One had been proposed by Ibn al-Haytham (AlHazen), (according to wikipedia; he was the discoverer of 'the scientific method' and inventor of every human discipline) which was to combine the two systems and make Aristotle's spheres so thick that the epicycles would run through them as through a channel. This would mean that the outside -the convex surface of each celestial sphere, and the interior concave surface of each celestial sphere- would actually be centred on the earth. The orbit of the planets would then run eccentrically through the think spheres, so both systems would be saved. 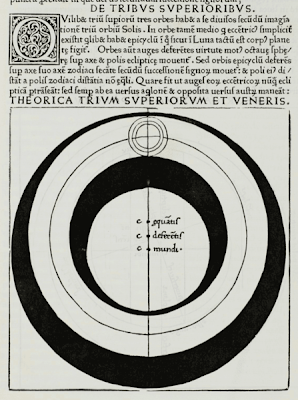 This ‘solution’ was picked up by Roger Bacon and was praised by several other Franciscans; it then became a standard model for thinking about the universe. Once the thick spheres had been incorporated, attempts could be made to measure the distances to the planets and the thickness of the spheres. For example, if the spheres are nested together with no spaces in between them, then we can use the thickness of the spheres to calculate the sizes of the orbits. Attempts to do this were made, the most famous by an Italian called Companus of Novara (although clearly not famous enough to get a wikipedia page). 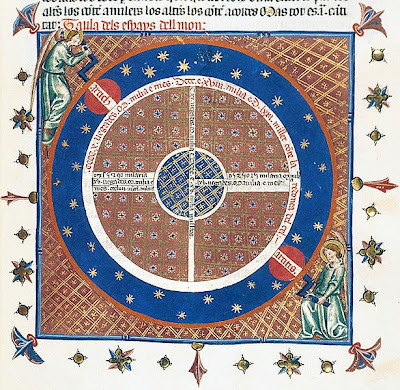 In the 1260 he wrote his ‘Theory of the Planets’ which attempted to give measurements for the size of the universe. He starts with the diameters of heavenly bodies, the sun being the largest with a radius of 17,850 miles. (modern calculations give it as 432000 miles; but nice try!). The moon is given as much smaller than the sun at a radius of under a 1000 miles (it’s really 2200 miles; but nice try!). He also tried to do the distances. For the moon he gave the inner surface of the moon sphere is 107,000 miles away. The outer surface is 209,198 miles away. He was actually quite close with that estimate, the moon is around 250,000 miles away on average. As he tries to calculate further and further away his estimates get more and more inaccurate. He says that Saturn for example is 73,383,747 miles away. The actual distance is more like 170,000,000 miles (not even close, but points for effort!). Nonetheless these were fairly reasonable attempts to judge how big the world actually was given the data and the instruments available. For someone living in the Medieval era, 73,000,000 miles is pretty damn big and so the Medieval universe was in no way small and comfortable. Celestial spheres which carried the planets were accepted as real solid objects by essentially everyone in the Middle Ages. But what would make these objects move? The traditions of Aristotle were very important and, unfortunately, Aristotle was totally contradictory on this point. On the one hand he said in ‘On the Heavens’ that the heavenly spheres are made of the quintessence (the so called fifth element) and that the quintessence has a natural motion in a uniform circular direction. In ‘The physics’ and ‘The metaphysics’ the great philosopher says that unmoved movers –some kind of intelligences which are external to the orbs – cause them to move without being affected by them. In some places he says the spheres are en-souled and alive, thereby capable of moving themselves. How can these mysterious unmoved movers move the spheres? Aristotle doesn’t give a whole lot of help here, in fact he says that they cause the motion by ‘being loved’; which sounds great in a kind of namby pamby, new agey kind of sense but doesn’t really tell us a great deal (One of the forgotten legacies of Aristotle may be that he was the source of the phrase ‘love makes the world go round’, now a somewhat cheesy tag line for Valentines day cards and pop hits across the western world). Medieval philosophers generally were unsatisfied with this rather cryptic explanation so they tried to find other solutions. God could be called in to be the single unmoved mover who causes the motion of the spheres, but that tended to violate the principle that god works through secondary causes (something that has also gone begging in the present day ‘Intelligent Design’ controversy). Some people instead proposed the idea that there were angels which had been created by God to cause the spheres to move. These were somewhat arbitrary supernatural entities, but at least they were secondary causes. This didn’t satisfy some people either because it violated the principle of naturalism which was so important. There have to be natural causes to things unless we cannot possibly avoid it! (yet another principle which seems to have been forgotten today; but I digress) As a result, some others like Robert Kilwardby (1215 –1279) and John Blund proposed that at creation God had implanted a natural motion in the spheres, which is similar to what Aristotle says in ‘On the Heavens’. Others argued that God had merely given a ‘push’ to the spheres to get them going and then they would keep moving for ever after. "one could imagine that it is unneccesary to posit intelligences as the movers of celestial bodies since the Holy Scriptures do not inform us that intelligences must be posited. For it could be said that when God created the celestial spheres, He began to move each of them as He wished, and they are still moved by the IMPETUS which He gave to them because, there being no resistance, the impetus is neither corrupted nor diminished." Sadly – or fortunately depending on your point of view - his successors like Albert of Saxony followed him in dismissing the angels. Henry of Langenstein (d 1397) severely restricted their role and Nicolas of Cusa (d 1464) got rid of them altogether. As well of getting rid of the angels, impetus also dealt a blow to Aristotle. The traditional view held that the heavens and the earth were made of different stuff and performed differently. Now, with the unity of heavens and earth, the same theories for both could be devised. This was part of a growing awareness throughout the thirteenth century and beyond, of a new concept of nature; a machine which acts according to quantitative laws. This would pave the way for conceptualising the world of physical science as something removed from direct observation and capable of mathematical expression. Another sighting of the flat earth myth. In high school textbooks. "It may end later, but I see no reason for its ending sooner…This I mention not to assert when the time of the end shall be, but to put a stop to the rash conjectures of fanciful men who are frequently predicting the time of the end, and by doing so bring the sacred prophesies into discredit as often as their predictions fail." Other possible examples of the strong influence of Newton’s theology include Newton’s view of salvation history as an undulatory cycling between reformation and apostasy and the development of his calculus. Newton’s calculus depended on a conception of absolute time and, as explained above, absolute time for Newton rested on a belief in God’s eternal duration. It is also plausible that Newton’s antitrinitarian view of a unipersonal God supported his understanding of the unity of nature. That even the heretical elements of Newton’s theology permeated his natural philosophy is made plain by his General Scholium, which, although an appendix to an ostensively purely natural philosophical work, is embedded with antitrinitarian biblical hermeneutics. For Newton, the feigned natural philosophical hypotheses of Descartes are no different than the doctrinal hypotheses of Trinitarianism. Corrupt interpretative practices in natural philosophy and theology are linked, just as the correct methods arriving at Truth are unified. 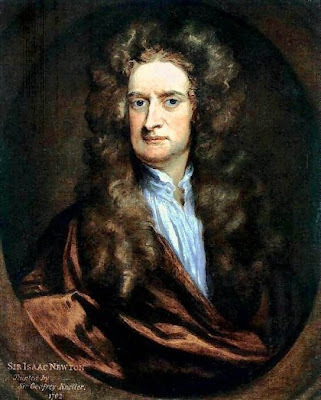 ‘Dobbs (professor of history at Northwestern University) has written at length on Newton’s conceptions of divine activity in matter – a nexus in his thought where theology and natural philosophy converged. It is likely that Newton’s God or dominion even impinged on his mathematics, because his method of fluxions (calculus) depended on the continuous flow of absolute time, which Newton associated with God, whose eternity and omnipresence is said in the General Scholium to be coextensive with time (duration) and space. In this case Newton’s theology helped shape the cognitive content of his mathematics’. Yes Kepler was influenced by religion to begin his search into the paths of the planets. And it was that religious teaching that led him down the path of trying to fit the paths into the ‘perfect solids’ for so long (long after he should have given up on that), due to his religious notions of a perfect harmony of the spheres. It was only when his work led him to finally drop that, seek out real data of the planets’ motions and take the more scientific route of trying all avenues to see what actually fit the data (as opposed to desperately trying to fit the data to the model) that he finally hit on the correct conclusions. Conclusions quite different than his religious ideas ever foresaw. It was a triumph IN SPITE of his religious ideas, not as a result of them, it was his honesty and passion to be willing to break free of the indoctrinated paradigm to seek the truth no matter where it lay that did it. Well not quite. His motivation was the development of a Christian Empiricism against a Platonic Rationalism. 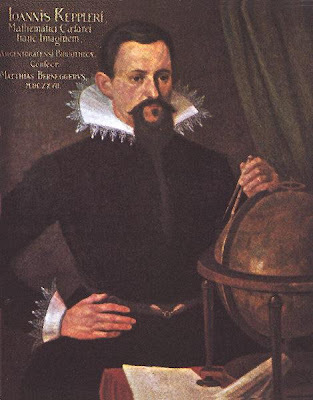 At the time there was considerable scepticism abroad that it was impossible to accurately map the planets, yet Kepler rejected this because of his conviction that the heavens must reflect their maker. His original model was heliocentric with the planets arranged in orbits determined by the five basic solids. The appeal was that this was a neat arrangement, however it was not precisely correct, and for Kepler even small errors were unworthy of the creator. Instead he collated the data and prepared the Rudolphine Planetary Tables with Tycho Brahe. His best model fit for the data was out by only a small degree (eight minutes of arc); but Kepler again felt that there was no imprecision about God and that he does not make eight minute mistakes (James Hannam tell us in God’s Philosophers that he later called this small difference ‘a good deed of God’s' and thought it critical for his later success). What Kepler did was then ditch the idea that the planet had to move in circles because it was a Greek addition to the basic principle that if the paths were ordained by God then they should be simple and elegant (a basic assumption of Greek astronomy was that the stars moved with a single regular circular motion, while the sun, moon and planets moved with combinations of regular circular motion). He then discovered the planet’s orbits are ellipses, that the axis of the orbit sweeps through a uniform area and that there is a mathematical relationship between the length of time it takes for the planets to orbit the sun and their distance from it, the famous three laws of planetary motion. As for breaking free of the ‘indoctrinated paradigm’ this was the chap who wrote ‘for a long time I wanted to be a theologian’, ‘now behold how through my effort God is being celebrated through astronomy’, ‘the heavens declare the glory of God and the firmament shows his handiwork’. His notebooks are mostly covered in mystical speculation and prayers. If Kepler were alive and on the Richard Dawkins forum today he would be no doubt be derided as a 'faith headed' purveyor of 'woo', 'hand-waving' and 'sky fairy worship'. 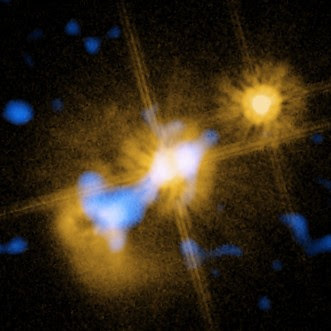 Some time ago I mentioned that galaxies appear to form around supermassive black holes in an act of co-evolution. Once formed, the black holes act as 'hearts' to the galaxies, pumping energy out at regular intervals to regulate the growth of the black holes themselves, as well as promoting star formation. When they reach a certain size they eject hot plasma. This heat slows the formation of new stars and the growth of the black hole itself. Another neat trick they seem to do is shoot out jets of high energy particles and fast moving gas. These travel at nearly the speed of light and emit radio waves. It has been speculated that most massive galaxies which contain black holes may have gone through an active stage where they spewed out jets, before settling down in the later history of the universe. In the early history of the universe these jets had a tendency to hit other galaxies, in the process carrying cold, neutral hydrogen gas and, intriguingly, water vapour. Cold gas happens to be a critical ingredient for star birth and these jets appear to have set off stellar baby booms. Earlier observations had shown that the companion galaxy is, in fact, under fire: the quasar is spewing a jet of highly energetic particles towards its companion, accompanied by a stream of fast-moving gas. The injection of matter and energy into the galaxy indicates that the quasar itself might be inducing the formation of stars and thereby creating its own host galaxy; in such a scenario, galaxies would have evolved from clouds of gas hit by the energetic jets emerging from quasars. Elbaz says stars probably don’t form this way in our region of the universe since it is home to old galaxies and hardly any quasars (which would have a destructive effect on life if it got in the way). But “it might have had a substantial impact on galaxy formation in early times,” about 10 billion to 12 billion years ago, when most galaxies were born and quasars were much more common. Rand Simberg: How Wide-Spread Is The Damage? 1. On global warming: I'm perfectly willing to accept the pronouncements of the consensus of scientists. 2. On anthropogenic global warming: Prior to all of this I was perfectly willing to accept the pronouncements of the consensus of scientists. Now I'm suspicious. 3. On catastrophic anthropogenic global warming: Like Glenn Reynolds says, "I'll believe it's a crisis when the people who keep telling me it's a crisis start acting like it's a crisis."